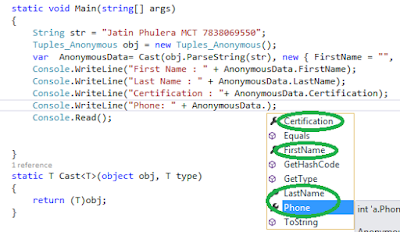 In this article i will explain about difference between Tuples and Anonymous Type with console Examples. First we understand what is Tuple and Anonymous and why we used them . A var data type and new keyword is used to create an anonymous type. 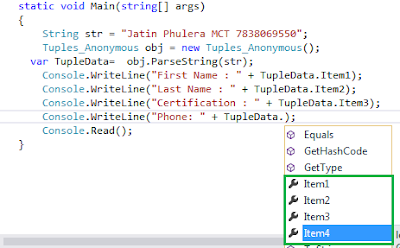 For Anonymous type, Visual studio able to show intellisense because type is known at the time of compilation. And Anonymous Type shows Strongly Type properties you can see in above image, all the four properties which i define using Anonymous in method are displayed in intellisense at compilation time ,which is the drawback of Tuples. According to MSDN "A tuple is a data structure that has a specific number and sequence of elements". The tuples are not new in programming. They are already used in F#, Python and databases. However, they are new to C#. The tuples were introduced in C# 4.0 with dynamic programming. //In C#, Tuple is a static class that implements the "Factory" Pattern to create instances of Tuples. We can create an instance of a Tuple using the constructor or the static method "Create". Tuples provide a quick way to group multiple values into a single result, which can be very useful when used as a return of function, without the need to create parameters "ref" and / or "out ". The DrawBack with Tuples is Tuples do not have names that may have some significance. The attributes of a tuple are called "Item1", "Item2", and so on. You can not find your actual Property name while printing the values. You can see this in below image. Hope you can enjoy this article and Happy coding.